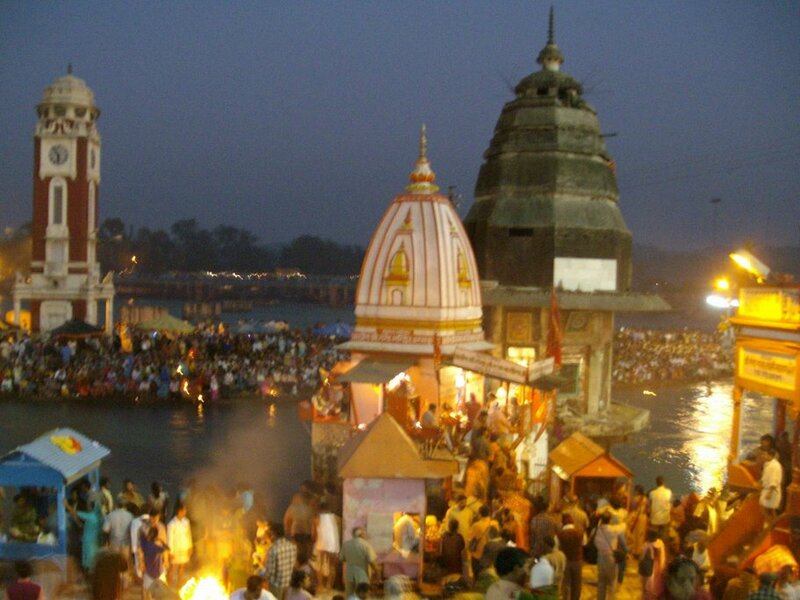 Devprayag – a truly holy confluence!......After the Ganga aarti at sunset, a pleasant conversation with the locals and some marijuana with a very authentic looking ‘baba’, there I sat on the sangam steps, gazing over the water, consumed by its sounds, the breeze and dimming evening. I thought perhaps this is what the Ganga is all about, why she is mentioned in all the holy texts, why so many lives depend on her and so many dreams float on her waters in the form of colourful donas! It was somewhere in that orange moment, the whole trip seemed to flash before my eyes – the day we applied to Life Unlimited, finding out we’d won, trying to keep out expectations from taking wing, thinking that I’d never get the permission to go, and the tired smile on my parents lips when they said “go”! There were only ten days left at the time; a whirlwind of planning, reservations, research, phone calls, shopping, packing and the final depart. The excitement, while the train pulled out of Mumbai Central station was so alive, I felt I could just hold it in both hands and hug it. 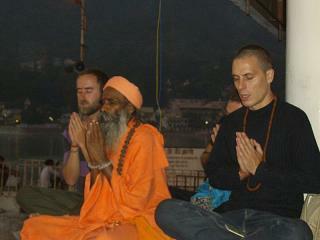 By day 2 we had found our way through Delhi and were soon jumping off the bus in Rishikesh where Usman joint us. And there it was! The river and her civilization, the root from which we all had grown! Bouncing down the road in a cycle rickshaw we reached our hotel at High Bank and found ourselves the only Indian guests! The ‘firangs’ were really friendly though and made for good conversation, particularly a chap called Ooly from Germany and a guitar playing stoned Israeli with a very confusing name. We were soon out exploring the streets of Rishikesh and found the town has 3 distinct cultural domains – the first was Ram Jhoola that was very ‘hindu’ and focussed on the Ganga. There were pilgrims and ashrams everywhere; every evening the ganga aarti was held on the banks of the river at the Parmarth Niketan Ashram. The aarti was attended by all sorts of people- pilgrims, foreigners, tourists, locals, old and young. There was even a baba(a well known fraud) who had four firang diciples of which David from USA, was the most devout. We bumped into Baba and David quite often during our stay, they always had some very heavy philosophy (generally on the meaning of life) to impart. Usman found these chats most entertaining. Then there was the Laxman Jhoola area which was intrinsically hippie, with foreigners everywhere, shops and cafes to cater to them (and Preksha’s shopping needs), yoga and meditation centres as well as fusion music concerts every night! The one we attended had an old sadhu and his cronies bringing together the music of the violin, tabla and sitar – their various sounds pouring into a single, simply divine refrain – so much like the ganga herself! Finally, there was the main city with the post office, train and bus stations and utility shops for the locals. But over-all I felt the town was beautiful, full of religion, music and cultures and we wanted to stay longer as we sat at Devraj Coffee Corner (our favourite hang-out already, a little café on a cliff, with unbeatable hot chocolate and look out at the river and Jhoola below). The next day we set off for Devprayag. The bus ride through the winding mountain roads revealed in full the beauty of north India - the thickly forested hills flanking the river, its slim silver banks catching the setting sun! We reached late in the evening and stayed at a very rustic government tourist guest house this time, with a friendly old Dutch couple in a campervan on the lawn outside. The next morning we went out to explore the city. The highlight off course is the Devprayag confluence with the jade waters of the Alakananda mixing with the bright blue water of the Bhagirathi. Surprisingly, there didn’t seem to be much of an economy around it save a few basic shops, guesthouses and a rice godown. It certainly looked like it could have done with a spot on the Beatles magic mystery tourmap in the eighties… and then again, maybe the nice bit was how tourist free and simple it was. We spent a little time with four carefree intellectuals – discussing everything from mythology to politics and the tehri dam with Dinkar Bhat, Purnanand Das, Shwetamber Dhyani and Maharaj Ganesh(the baba, and most stoned of the lot). The Ganga aarti here was a much smaller affair, less commercial and attended by only a handful of locals. It was after this that I sat to think. Half the trip was over, the group had gelled so well. From all of us having completely diverse opinions and ways to go about the trip, we had managed to reach a via-media. We understood each other and we were having a great time. A day later we went to Haridwar, and attended the Ganga Aarti at Har ki Pairi which was definitely the fanciest and most commercialised so far and then went crazy in the market - a kaleidoscope of colour on the riverbank. In every nook and corner nestled a restaurant. They differed in size but were similar in the fact the food across was great! I have never had better parathas, kadhai doodh or mithai! Monkeys on the balcony, cold dips in the river and cycle-rikshaw rides peppered our 3 day stay. My favourite part was when we wandered along the banks of the river till we’d left the city behind and bumped into a group of kids looking for coins in the water. Picking up money devotees offered the waters upstream, was their means of living. We spoke to the children and some villagers from a settlement near by, and had chai at a tiny stall. Having spent my life in cities like Bombay and Pune, the afternoon was an insight into rural India, the simplicity and pathetic poverty of her people! Our random walks, the strangers who became friends, and our first independent trip together certainly contributed as much to making this a once in a lifetime experience, as actually working on our culture study! Those ten days were really life unlimited. I’d sincerely like thank LU for everything, for this opportunity to become more independent, confident, and responsible, study the roots of the civilization that I am a descendant of, and off course, have a blast! The next morning we were to leave for Delhi enroute to Mumbai. On our last evening we did something as spontaneous and fun as the trip had been – a befitting way to end it! At seven in the evening we got into a vikram and went back to Rishikesh, to Devraj Coffee Corner where we sat one last time drinking hot chocolate and looking out over the Ganga as she glistened by.